Bronchitis is a respiratory disease characterized by inflammation of the bronchi or branches of the trachea due to viruses or bacteria. It is a type of chronic obstructive pulmonary disease (COPD) and can affect people of any age. The answer to this question can be yes and no! Only the type of bronchitis caused due to viral or bacterial infection is contagious. Some cases of acute bronchitis are contagious, not chronic. Therefore, it is essential to find out the cause to determine whether or not it is contagious. 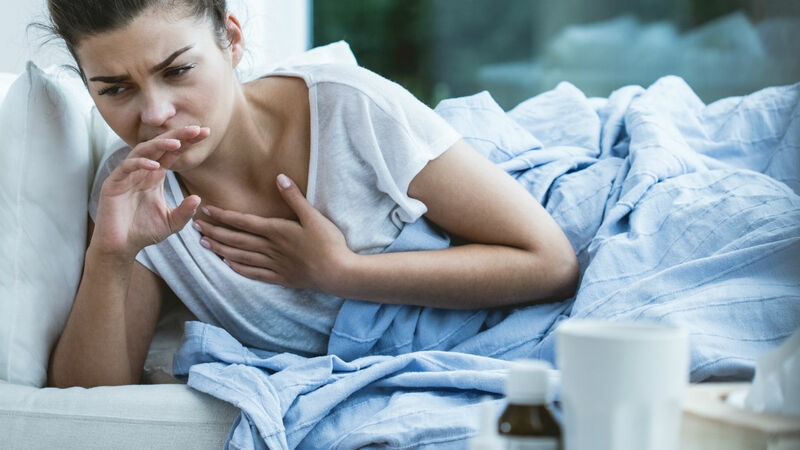 Acute bronchitis is a disease that is in the air, and therefore, can spread if an average person comes in contact with the body fluids of the infected person. In contrast, chronic bronchitis is usually caused by smoking and other reasons and therefore is not contagious. What is the period of contagion of bronchitis? Bronchitis is considered contagious while symptoms are observed. It is essential to have immediate treatment if you notice any symptoms. Although mucus clears up and symptoms are reduced by taking antibiotics, bronchitis can be contagious until all symptoms disappear altogether. However, as maximum cases are caused due to viral infection, antibiotic treatment is not always used. Children and the elderly may be more susceptible to acute bronchitis than people belonging to other age groups. You should also remember that bronchitis in children is very common, and therefore, parents should be very careful and consult the doctor if symptoms are observed. These were the most frequently asked questions about bronchitis. Here is more detailed information about the disease. As the internal membranes of the bronchi are infected or inflamed, there is an excess of secretion of mucus, which can even lead to obstruction of the ducts. Acute bronchitis is caused by viruses and bacteria. 90% of severe cases are caused due to viral infection. Influenza virus, rhinovirus and respiratory syncytial virus (RSV) are the viruses that cause bronchitis. Whereas, bacterial bronchitis is caused due to Streptococcus pneumonia (pneumococcus), Mycoplasma, etc. On the other hand, chronic bronchitis can develop after prolonged inflammation or infection of the airways or bronchi. On the other hand, factors such as smoking, constant exposure to industrial pollutants, and cold air can cause chronic bronchitis. It should be remembered that secondhand smoke (also known as passive smoking) is also one of the leading causes of chronic bronchitis. If you notice any of the above symptoms frequently, you should consult your doctor immediately. A chest X-ray is useful in the diagnosis of bronchitis. Treatment varies depending on the cause of the disease. The doctor will prescribe antibiotics, since taking antibiotics is the most efficient way to treat bacterial bronchitis. Similarly, being in complete rest, drinking lots of fluids and using a vaporizer also helps in treating viral cases quickly. Moreover, the use of bronchodilator methods, steroids, medications, therapies, etc. helps in the treatment of chronic bronchitis. As we have just seen that bronchitis is contagious, it is better to take preventive measures to avoid it. Vaccination is the best method to prevent bronchitis. To prevent chronic cases, one must stay away from the people who suffer from it. It is also recommended to avoid sharing personal items of daily use such as towels, toothbrush, etc., food or clothing with people suffering from this disease. Moreover, quit smoking and exposure to industrial irritants to avoid chronic bronchitis. Finally, remember the old saying, prevention is better than cure! Therefore, you should follow all precautionary measures and prevent bronchitis and other respiratory diseases. Disclaimer: This article was only designed to provide information, and should not be used to substitute for proper medical advice.